Team Kawasaki will head North of the border for round eight of the British Superbike Championship next weekend, after securing backing for the rest of the season from Tau Ceramica, one of Europe's leading ceramic tile manufacturers. "The news that Tau Ceramica have stepped in to back the team for the remainder of the season is fantastic," said Michael Rutter, currently lying fifth in the championship standings. "I'm grateful to Hawk Racing for allowing me the use of their spare bike at Oulton Park, but I'm looking forward to getting back on the factory Kawasaki and reclaiming fourth place in the Championship." "We're testing at Knockhill on the Thursday before race weekend, so we should be well up to speed by the time qualifying gets underway," continued the 1998 Junior TT winner. "The team have worked flat out to get us to Knockhill and I'll be looking to repay all their hard work with two good results on race day." Team Manager, Simon Buckmaster: "Tau Ceramica and William Taylor Pools have shown tremendous support for the team, as have our other sponsors; Dunlop, Rock Oil and WP Suspension. They, along with Kawasaki Motors (UK), have been instrumental in getting the team back on track for Knockhill and allowing Michael to reclaim his seat on the factory Kawasaki ZX-7RR." 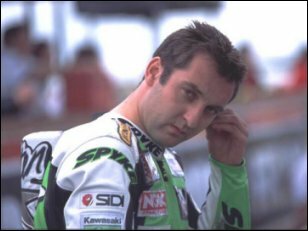 "With Steve Plater away on World Supersport duty, Michael will be the sole factory Kawasaki rider on the grid at Knockhill," continued the former Grand Prix and World Endurance rider. "Riding without a team-mate isn't an ideal situation but, with Michael being one of the most experienced riders in the championship, I'm confident that he'll continue the form that has seen him on the podium on two occasions already this season. There is a chance that Steve could ride for Kawasaki again before the end of the season, but that will be dependant on the team securing additional funding." Allthough the team should survive until the end of the year, it is unlikely that Kawasaki will be able to field a works team in 2002 at British Superbike level, without the massive finance required, and with the class cc limit being opend up to accommodate the R1 Yamaha's, Honda Fireblades and GSXR 1000 Suzuki's next term. This could mean another switch of teams for Ruter, which might see him return to the Road Races again in 2001.